Kearsney Manor, on the Alkham Valley Road, can best be seen from the Lower Road leading to Temple Ewell. 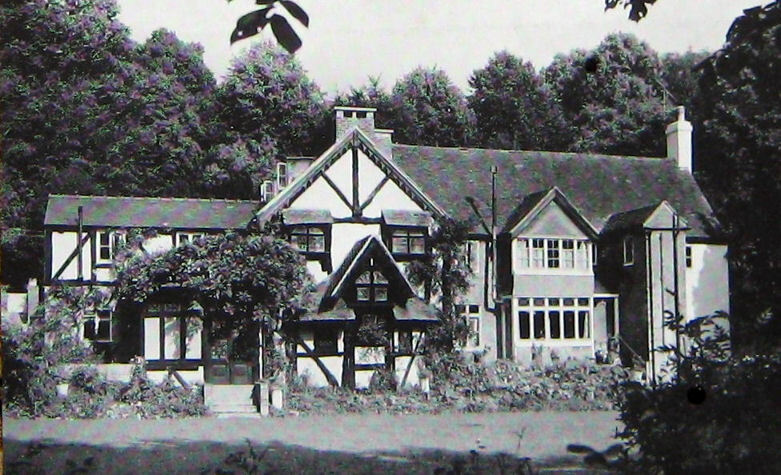 Although the ancient black and white building was originally known as Kearsney or Casney Court the name was changed to Kearsney Manor after the new Kearsney Court was built in 1898. Kearsney, was once part of the medieval Barony of Saye and by 1490 was in the possession of the Roper family of Canterbury. About a century later the estate was sold to the Best family, also of Canterbury and over the succeeding centuries was passed through many owners several. In 1701, the hamlet was in the hands of John Sladden, a Dover Merchant who gave it to his sister Mary on her marriage to Thomas Fagge, also of Dover. 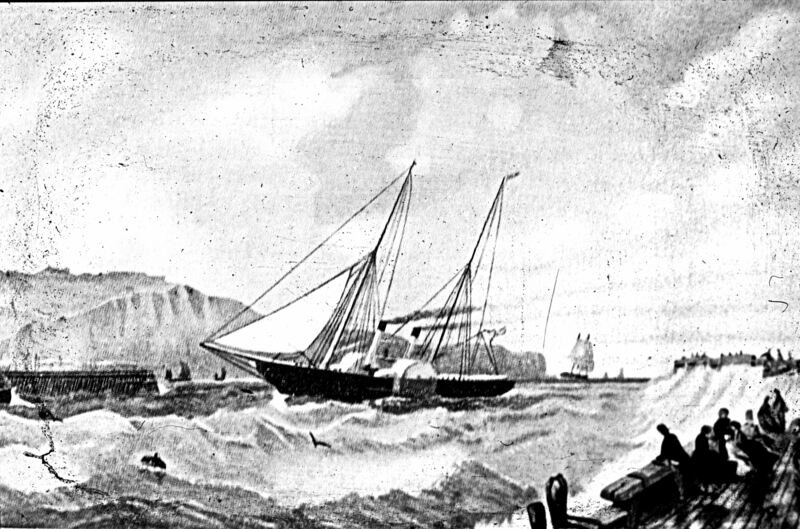 In 1788, Thomas Biggs of Dover inherited the lands and two years later sold it to banker, Peter Fector (1723-1814). What we now call Kearsney Manor was purchased as a country home for his son, John Minet Fector (1754-1821). He resided there until his sudden death on 12 June 1821 but at that time was having, what was to be the palatial Kearsney Abbey built. This his wife and son moved into when completed, but on reaching the age of majority, John Minet’s son, also named John Minet (1812-1868), his mother temporarily moved into the Manor while another house at Laureston Place, in Dover was being built. Along with the Manor, Peter Fector bought Kearsney corn mill that was at that time leased to the Pilcher milling family. This was rebuilt in 1811 and the lake was created that we see today. John and Christopher Phipps were tenants in 1830. 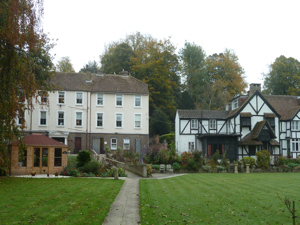 By 1856, Alfred Stanley of Temple Ewell was renting the mill and he bought it two years later. John Minet Fector jnr. put the Manor, the Abbey and the remainder of the estate on the market in 1844 and it was bought by E.C Jones. 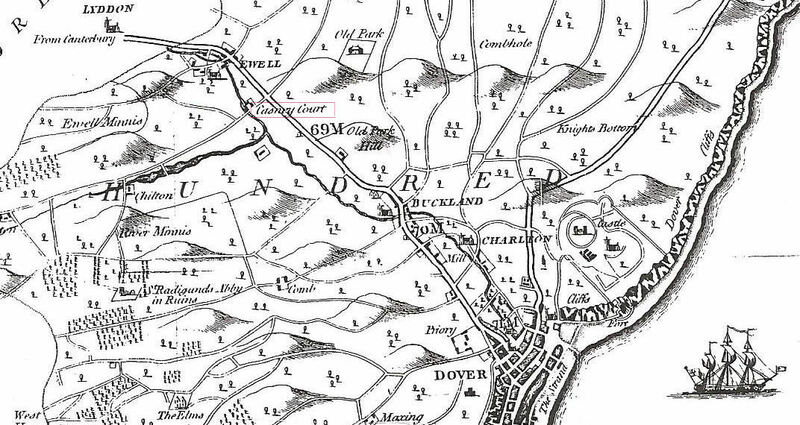 The estate was sold in 1870 to Joseph George Churchward (1818-1900) a journalist who came to Dover on winning the contract in to convey mails between Dover and Calais in 1853. Churchward and his family lived in the Abbey until he sold it to F Lyon Barrington who died in 1877 and then it came into the possession of the John Henry Loftus 4th Marquess of Ely (1849-1889). At both the Abbey and the manor the Churchward family were attended by a full retinue of servants under the charge of an imposing butler named Sutter Sulliman from Persia. The Mail Packet service proved very profitable, and Churchward built up a fleet of six new and fast steamers with comfortable cabins for all classes of passengers. He also built the Packet Yard, in Snargate Street, for keeping his steamboats in good repair. When he won the Belgium mail contract, he increased his fleet by three and these gave him the scope, when he won the French mail contract, to provide an efficient service that was envied by his rivals. By the time Churchward bought Kearsney Abbey and Manor, he was a wealthy man having been one of the town’s largest employers when his interests had turned to politics and running local newspapers. All of which made him the most important person in local politics that even parliamentary candidates could not afford ignore. Churchward was elected Mayor in 1867, and in that position presided over the initial hearing of Thomas Wells who was accused of murdering Dover Priory Station Master, Edward Walshe. Wells was later found guilty and hung. Although he enjoyed a successful year as Mayor, Churchward preferred the more powerful role of the town’s political puppet-master. However, in 1894 he accepted the post of chairman of Dover Rural District and by virtue of the new Act became a county Magistrate. With increasing ill health however, Churchward decided to move to London where he died a few weeks later on 2 January 1900 age 81. Frank Leney (1871-1927) of the brewing family, moved into Kearsney Manor following his wedding in 1900 and he extended and modernised the building. However, in 1902 Leney became ill and moved away and the Manor was put on the market. 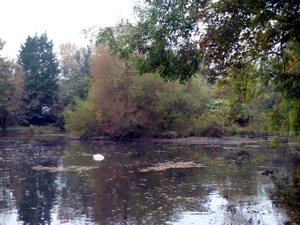 Kearsney mill was closed that year but not demolished until 1953 – the foundations are still visible in Kearsney Manor gardens. An Order of Augustinian nuns, formed in Arras, France in 1823 and known Les Dames Augustines du Frécieux Sang, expressed interest in purchasing the Manor. At the time, the French Government were instituting the separation of the Church from the State, which came into affect in 1905. This prohibited the official recognition, payments or subsidies to any religious organisation and a large number of religious community’s sort to leave the country including Les Dames Augustines du Frécieux Sang. In 1903, they sought permission from the Archbishop of Southwark, Bishop Francis Bourne, to convert the Manor into a convent. He agreed as long as a chapel was built and there was always a full time chaplain in residence at the time the priest was Father Charles de Vreindt. The main convent building, which included a small chapel, was completed by the following year and the nuns opened a boarding school for girls. Yvonne Vendroux, the wife of the former French President, General Charles de Gaulle, was a pupil. As the number of Roman Catholic residents in the area increased so did the demand for a free-standing larger chapel. This was built by the main entrance to the Manor and was officially blessed on 6 September 1913. The school was not so successful following World War I (1914-1918), possibly due to the economic depression, so the nuns started taking in female paying guests. One such lady was Mary Geddes, who first arrived in 1923 and came for her summer vacation every year up until World War II (1939-1945). A teacher of music, Mary was a lady of limited means and as the years passed, she paid less towards her upkeep usually pleading poverty. During World War II, the nuns moved away and the Manor was under the care of a caretaker and his wife and child. On 8 February 1941, the house was badly damaged by fire that broke out in the roof in the early hours of Saturday morning. The caretaker and his family managed to escape unhurt. The nuns returned following the War and so did Mary Geddes, who became a permanent resident. However, still pleading poverty she was more of a guest than a fee-paying resident. During the next sixteen years, until her death in 1967, she never had a letter or a visitor. So it came as a surprise to the Convent when her Will was published, she had bequeathed them over £40,000! At that time, besides taking paying guests the nuns were admitting medical, convalescent, geriatric and occasional surgical cases to their care. When Sister Clare of Montefalco and Sister Mary of Nazareth, two qualified midwives, came over from France a ten-bedded maternity unit was opened. This proved popular and took the strain off the over-stretched maternity ward at Buckland Hospital. However, staffing made the unit costly and it closed in 1965. About that time the widow of local master craftsman, William Parker Hedgecock, presented a magnificent copy of a 14th century window at St Magdelene Church, Oxford, to the Manor. The window had previously adorned the Hedgecock’s home in Old Park Road. Placed in the chapel, it was admired but the last time it was seen was in January 1981. That year the Augustinian sisters, becoming old and with no young blood to replace them, returned to their Mother House at Arras. 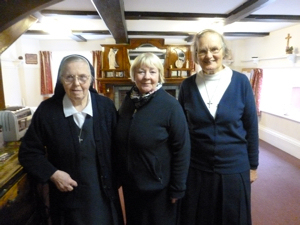 The Manor was bought by the Sisters of the Christian Retreat, a Registered Charity that undertook extensive refurbishment and reopened the Manor as a nursing and residential facility. The Archbishop of Southwark, Michael Bowen, blessed the chapel on 24 May 1983. In 2016 this author was invited to visit Kearsney Manor where she met Srs Melanie, Anne & Colomba, who made her most welcome. 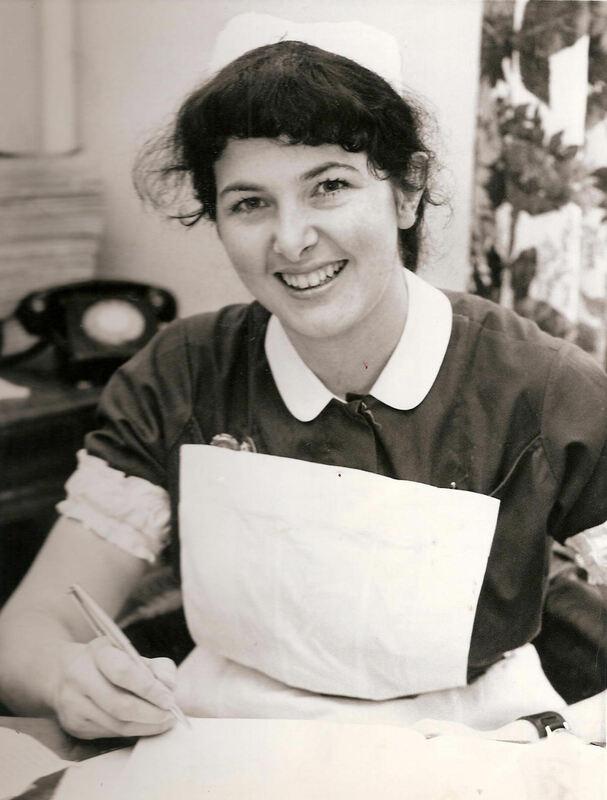 Of interest, the author was a lay-Sister at Kearsney Manor in the 1970s and following the uploading of this story is delighted to say that she was able to make contact with Sister Mary of Nazareth! Sadly, Sister Mary of Nazareth passed away in 2017. Following a damning Care Quality Commission report in May 2018 Kearsney Manor will close in the summer of 2018. The Care Quality Commission, or CQC, ensures health and social care services provide people with safe, effective, compassionate, high-quality care and encourages these to improve. The underlying blame for the failings was based on the lack of leadership due to a decline in the number of Sisters due to old age and ill health. This entry was posted in Hospitals and Health, Kearsney, Kearsney Manor, Kearsney Manor. Bookmark the permalink.